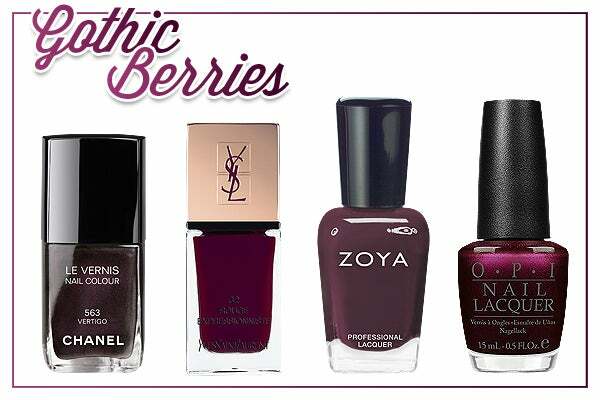 We know it’s about a billion degrees out right now and the last thing you want to think about is cozy autumn layers, but…the upcoming season's lust-worthy polishes will not be ignored. Fall’s fingertip color palette of tough-meets-girly, dark romance, and not-so-neutral nudes has us panting, and it’s not just from the boiling temps. Here, we’ve outlined our top 8 favorite polish trends, plus the new shades you need to snag to decorate your digits when cooler days descend. We won’t blame you if you want to rock these haute hues right this second, but we suggest holding off on the chunky knits and wool pants for now, or at least until we get out of triple-digit territory, weather-wise. Heat stroke is so not a good look. Creamy teal hues combine sophistication and whimsy in one contradictory hue. Because the color is so deep and lush, it tones down the actual brightness of the shade and makes it feel luxurious, without being too safe or played-out. 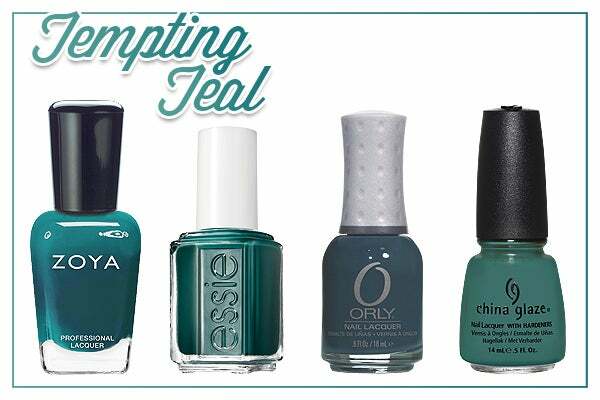 Zoya Nail Polish in Frida, $8, available at Zoya; Essie Nail Polish in Stylenomics, $8, available in September at Essie; Orly Nail Lacquer in Decoded, $8.50, available at Orly; China Glaze Nail Polish in Exotic Encounters, $6.99, available at China Glaze. 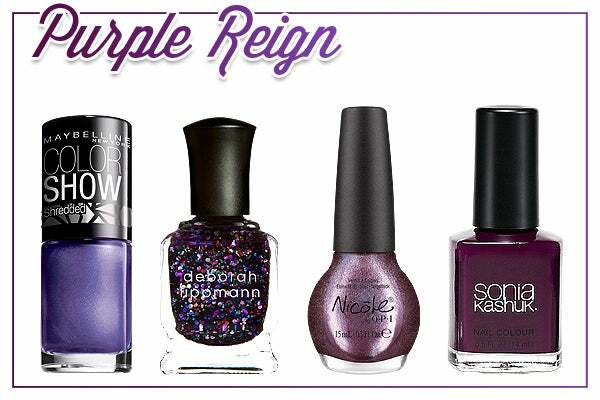 Purple is the party shade of the season, popping up in all kinds of fun and funky textures. The usually girly hue toughens up with chunky glitter, sleek metallic finishes, and a cool shredded effect. Maybelline Color Show Nail Color in Purple Possibilities, $3.99, available at Drugstore.com; Deborah Lippmann Nail Lacquer in Let's Go Crazy, $18, available at Nordstrom; Nicole by OPI Nail Polish in Busta Mauve, $7.04, available in August at Target; Sonia Kashuk Nail Colour in Hocus Pocus, $4.79, available in August at Target. People make yearly pilgrimages to catch the changing leaves, but you'll need to look no further than your fingertips to get a great view of nature's most spectacular color show. Rusty red, goldenrod, and burnished orange hues are plentiful for autumn, and besides being seasonally appropriate, they're also unexpectedly chic, especially when paired with an earth-toned wardrobe. Sally Hansen Complete Salon Manicure in Gilded Lily, $7.99, available in August at Sally Hansen; Butter London Nail Colour in Shag, $14, available in August at Butter London; China Glaze Nail Polish in Desert Sun, $6.99, available at China Glaze; OPI Nail Lacquer in Snapps Out Of It, $8.50, available in August at OPI. Green is the nail shade that just won't go away — we've seen countless variations on the hue over the past three seasons. This fall, the color goes military with a twist, combining army-issue fatigues with a metallic sheen. 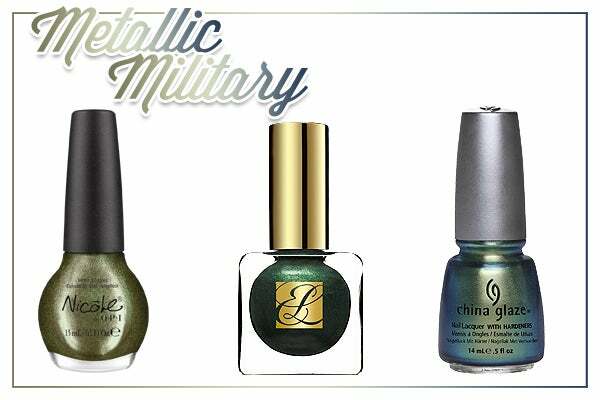 The result is a golden-green shade that has a utilitarian undertone and also manages to look pretty damn glam. Nicole by OPI Nail Polish in For Gold Times Sake, $7.04, available in August at Target; Estée Lauder Pure Color Nail Lacquer Beyond Black Collection in Viper, $20, available in August at Estée Lauder; China Glaze Nail Polish in Unpredictable, $6.99, available in August at China Glaze. 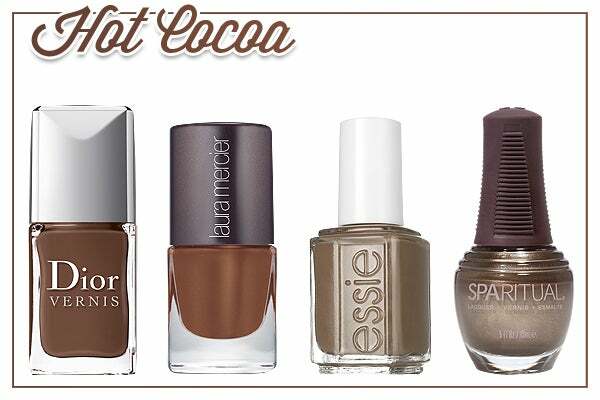 Our love of chocolate extends to our nails with a little help from this next trend, which features cozy shades of brown. Perfect for girls who aren't big on color, it's an ideal replacement for your usual taupe. Any of these dreamy browns should amp up your nail game without forcing you to resort to wearing Day-Glo digits. Dior Vernis Nail Lacquer in Bengale, $23, available at Neiman Marcus; Laura Mercier Nail Lacquer in Cocoa Suede, $18, available at Nordstrom; Essie Nail Polish in Gym Dandy, $8, available in August at Essie; SpaRitual Nail Lacquer in Slate, $10, available at SkinStore. Traditional berry gets an edge with the addition of dark undercurrents. If you're usually into reds, switch out your signature scarlet shade for a blackened berry to up the sexiness and add a bit of dark romance to your look. These moody shades retain their femininity, but also have a hint of mystery that gives them a dark edge. Berries with bite, if you will. Chanel Le Vernis Nail Color in Vertigo, $26, available at Chanel; Yves Saint Laurent La Laque Couture in Rouge Expressionniste, $25, available in September at Yves Saint Laurent; Zoya Nail Polish in Katherine, $8, available at Zoya; OPI Nail Lacquer in German-icure by OPI, $8.50, available in August at OPI. The sidewalk won't be ending anytime soon, as least if we have anything to say about it. Concrete gray is our new favorite non-color — softer than black, but a whole lot more impactful than white. Try it in dark, stormy colors, or opt for a foggy iteration with a bit of bling in it. 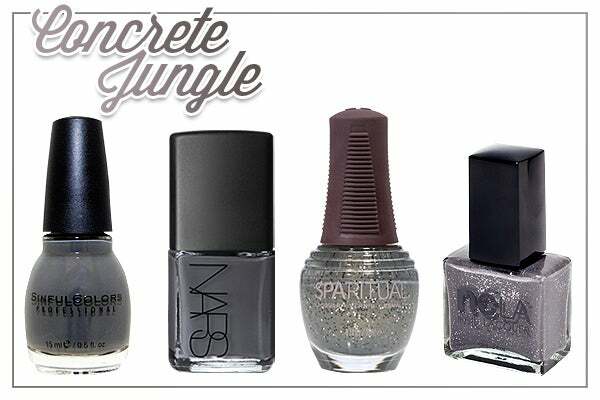 Sinful Colors Nail Polish in Smokin', $1.99, available at Walgreens; NARS Nail Polish in Storm Bird, $18, available at NARS; SpaRitual Nail Lacquer in Conglomerate, $10, available at SkinStore; NCLA Nail Lacquer in Rock Solid, $16, available in September at NCLA. Look, we loved aqua just as much as you did, but the under-the-sea shade kind of clashes with fall's darker, more muted clothing color palette. 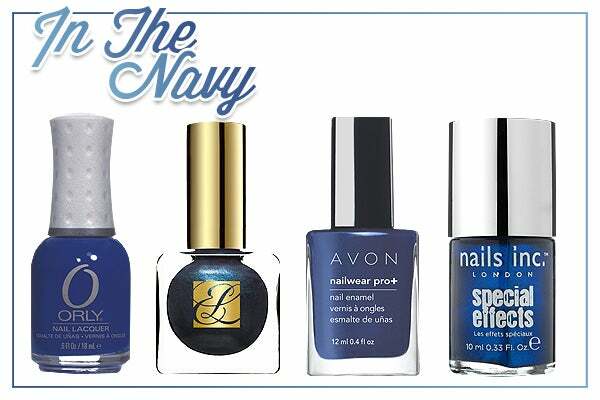 So, instead, keep your marine theme going through the colder months by adding navy into your repertoire. It looks elegant, sophisticated, and all-around awesome once the temperature dips. Be sure to choose a vibrant version with lots of blue shot through it — muddied up or grayed-out shades won't pack quite the same punch. Orly Nail Lacquer in Shockwave, $8.50, available at Orly; Estée Lauder Pure Color Nail Lacquer Beyond Black Collection in Blue Blood, $20, available in August at Estée Lauder; Avon Nailwear Pro+ in Inky Blue, $6, available in August at Avon; Nails Inc. Special Effects Mirror Metallic Nail Polish in Primrose Park, $9.50, available in September at Sephora. Photos: Courtesy of Orly, Estée Lauder, Avon, Nails Inc.